She Wood Golden Light Wood is a popular perfume by Dsquared² for women and was released in 2011. The scent is woody-floral. It was last marketed by Angelini Beauty. Golden Light Wood is a warm, yet refreshing woody white floral- likely to appeal to anyone who finds Alien attractive, but too intense for daily use. With my chemistry, orange blossom usually dominate and drown out everything else- but here, it is playing a masquerade! I smell jasmine and violet, but they're not listed here- puzzling! There is a pleasant juxtaposition between soft, warm heliotrope and the sharper woody and citrus notes- the result is a delightfully wearable scent with incredible longevity. I have been quite pleasantly surprised by Dsquared SHE WOOD GOLDEN LIGHT WOOD. While I like the original SHE WOOD, this flanker is somehow better. The orange blossom smells clean and fresh and airy. It's also watery, just like its namesake--along with lots of other light florals (especially violet!) created in that same mold these days--but somehow the whole production smells more natural to me. There is less wood and more flower here, so I feel a bit like walking on clouds with a light mist of tiny drops hanging in the air all about me. I believe that GOLDEN LIGHT WOOD was a limited edition, but I can recommend Prada INFUSION DE FLEUR D'ORANGER as the closest among the orange blossom compositions I've tried to date. There is one pretty big difference, though: the Prada is rather soapy, while the Dsquared is not. I've been on an orange blossom journey lately and these two have ended up being my favorites. I find them uplifting but not very citric, so they seem more like perfume than cologne, despite the more common use of orange blossom in the latter. 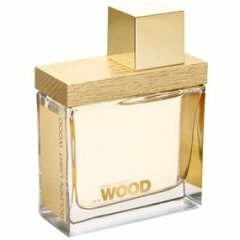 Write the first Review for She Wood Golden Light Wood!